Congressman Roskam says coming year 'pivotal' in stopping Iranian nuke, presents Bibi with painting by his wife. US Congressman Peter Roskam (R-IL), co-chair of the House Republican Israel Caucus, responded to Prime Minister Binyamin Netanyahu's Congress on Tuesday, warning the coming year will be "pivotal." "Prime Minister Netanyahu delivered a powerful speech this morning focused on strengthening the eternal bonds between the United States and Israel," remarked Roskam. "This will be a pivotal year in our common quest to fight Islamic extremists and prevent Iran from ever developing a nuclear weapons capability." Condemning the nuclear deal being formulated by US President Barack Obama's administration, he added "negotiations with Tehran only continue to embolden the world’s leading state sponsor of terrorism, and I wholeheartedly agree with the Prime Minister that any final agreement that leaves Iran a threshold nuclear power is a bad deal." "A strong US-Israel relationship is a strategic necessity to ensure the security and safety of both nations, and I encourage my colleagues on both sides of the aisle to join me in redoubling our commitment to this critical partnership," said Roskam. 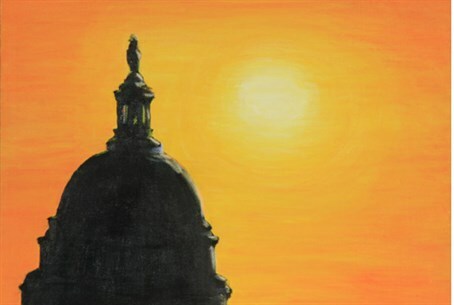 During Netanyahu's visit Roskam presented Netanyahu with a painting by his wife Elizabeth entitled "Dome of Consequence," showing the Capitol Dome in a golden cascading sunlight. "This painting speaks to the unparalleled consequence of the decisions made in the US Capitol, which affect not only the American people but our most trusted allies and partners," the Congressman added. "Prime Minister Netanyahu shoulders the weight of heavy decisions every day to ensure the safety and security of his country, and I am honored to present him with this painting."